How did a rock guitarist get involved with choral music? Bob Lord is a producer, a composer, and a musician. He plays bass in a rock trio he formed 17 years ago. "Yeah, my trio, Dreadnaught, sounds like Yes and Willie Nelson. And we opened for John Entwhistle right before he died on his last solo tour. The thing I learned from him is anything is possible. Follow your passion. He did it from the heart and I think that's something I communicate to all my employees, all my friends, associates, colleagues; if you do it with passion, then it's never a job." "Classical has been a passion of mine for a very long time," Lord admits, "I think I first heard the very opening of Petrushka when I was in my mid-teens and I think I never looked back after that. It just really hooked me." And that's how a rock musician and producer becomes the CEO of a classical record company based in New Hampshire. Navona Records recently released Voices of Earth and Air, a collection of choral music featuring five contemporary composers. "I think choral music is something that is really close to the hearts of a lot of composers because when you think about the connection of music making and the human voice, the throat, the physicality of it. I think that a lot of composers save their most inner thoughts and expressions and feelings for this particular format. "We record frequently with choirs in both the US and in Europe. And in this particular case we had a couple of pieces that we were working on with my longtime friend, composer Michael Cunningham. And when we realized that we had a couple of pieces that hung well together we said, why don't we try to make a full choral compilation out of this?" Voices of Earth and Air opens with a piece by Cunningham called Come, Holy Spirit. Its dissonant quality is similar to what you might hear in medieval and Renaissance music. "Michael is a composer who is completely unafraid to challenge you and I think there's a reason why we put this on the album first," Lord explains. "We wanted to create an experience right out of the gate that's going to say, hey. This isn't exactly what you might expect." Shaping each performance — that's what Bob Lord loves about being a producer. Lord recalls the thrill of working with the Kühn Mixed choir on Michael Cunningham's suite Posies, based on four poems by Scottish poet Robert Burns. "In The Lazy Mist, for example, we did a lot of takes of that differently, different tempi, exaggerating dynamics, working a lot in sculpting what was not only on the page but what we were hearing in real time. And I think fidelity to the score is crucial. I think when you're working with a living composer — and we work with hundreds of them — it's very vital that you actually get what's on the page. But once that's done, then I think that there's something really magical that can happen when you say, alright, let's have some fun, let's try some stuff out." For something completely different, check out Song of Perfect Propriety. Minnesota-based composer Carol Barnett revels in the levity of this piece which is based on a poem by Dorothy Parker. "I believe that so many composers and artists and companies and everybody are so busy being serious that when I first heard this recording I was just delighted. I laughed my head off. I thought it was fantastic. And it's not at the expense of being a serious musical statement. And I think that's tremendously exciting." The New York Virtuoso Singers were founded in 1988 by conductor Harold Rosenbaum. They've become one of the leaders in commissioning, performing and recording the music of American composers. On this recording, they're featured on Elegy on the L.C. by Alexandra Ottaway. "I think Harold is one of the great talents in choral music. In the years to come, people are going to say, this is a guy who did a lot of vital work in the choral and music fields. So having Harold on board — coming in, working with the composers and making great music and knowing this is one of the greatest interpreters of our country at this time — that was also very gratifying." "A large part of my mission and the mission of the companies is to be advocates for living, breathing music," Lord explains. "And in this particular case, I think working with folks who are alive and are creating and who are actively focused on making new music and new combinations and new sounds — that to me is what's really exciting." 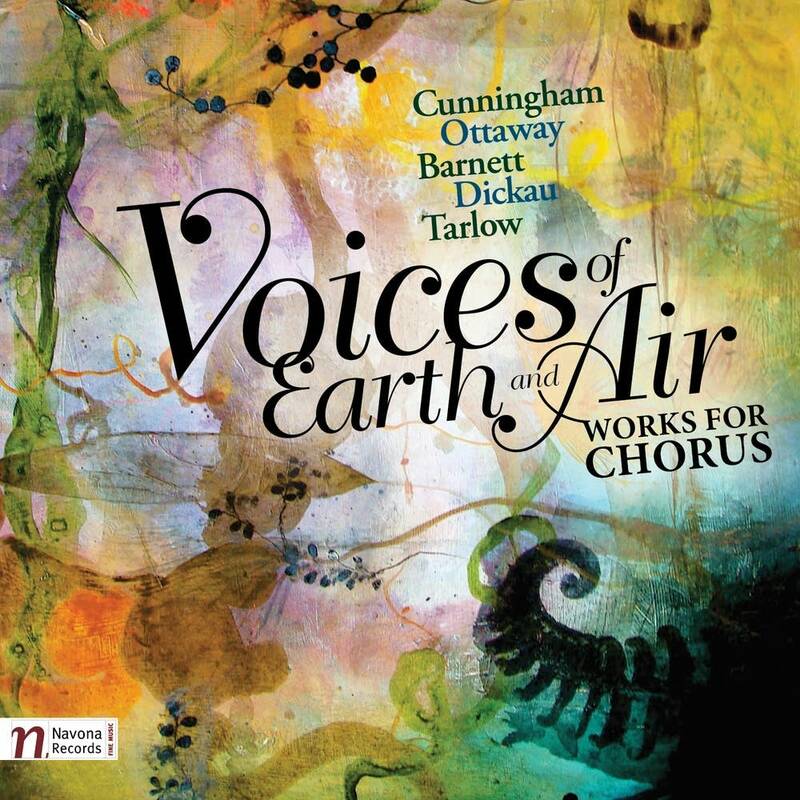 Voices of Earth and Air — it's a new collection of works for chorus, featuring various ensembles performing pieces by five contemporary composers, all of whom are breathing life into new music.